A newspaper is a publication containing news, information, and advertising, usually printed on low-cost paper called newsprint. The content may be general or special interest, and is most often published daily or weekly. The first printed newspapers appeared in the seventeenth century, and their circulation increased until the late twentieth century, when developments in technology, especially the internet, posed major challenges to its business model. Paid circulation declined in most countries, and advertising revenue, which makes up the bulk of a newspaper’s income, shifted from print to online, resulting in a general decline in newspaper profits. This has led to some predictions that newspapers’ role in society will shrink or even disappear, although historically new media technologies, such as radio and television, did not supplant print media. The first newspapers appeared as a daily news posting known as Acta Diurna (Daily Events) in Rome in 59 B.C.E. The first printed paper appeared in Beijing in 748. The first paper using the printing press was published in Germany in 1502. The Oxford/London Gazette, considered to be the first modern newspaper for its use of double columns, appeared in England in 1557. Rising literacy, dense populations in urban centers, and new technology all led to the popularization of newspapers as a medium for spreading news. Previous methods, such as town criers, public postings, or word of mouth, gradually faded away as newspapers became more readily available. Many ways to classify newspapers exist, including frequency of publication, language, region served, and topics covered. A "daily newspaper" is issued every day, often with the exception of Sundays and some national holidays. Saturday and where they exist Sunday, editions of daily newspapers tend to be larger, include more specialized sections and advertising inserts, and cost more. Typically, the vast majority of these newspapers' reporters work Monday to Friday, so the Sunday and Monday editions largely depend on content done in advance or content that is syndicated. "Weekly newspapers" are also common and tend to be smaller and less prestigious than daily papers. However, those "Sunday newspapers" that do not have weekday editions are not considered to be weekly newspapers, and are generally equivalent in size and prestige to daily newspapers. Most nations have at least one newspaper that circulates throughout the whole country: a "national newspaper," as contrasted with a "local newspaper" serving a city or region. In the United States and Canada, there are few truly national newspapers, with the notable exceptions the Wall Street Journal and USA Today in the U.S. and the Globe and Mail and the National Post in Canada. Large metropolitan newspapers with expanded distribution networks such as the New York Times and the Washington Post can fill the role of de facto national newspapers. In the United Kingdom, there are numerous national newspapers, including the Times, the Daily Telegraph, the Guardian, the Observer, and the Daily Mail. Newspapers often refine distribution of advertisements and news through zoning and editioning. Zoning occurs when advertising and editorial content change to reflect the location to which the product is delivered. The editorial content often may change merely to reflect changes in advertising—the quantity and layout of which affects the space available for editorial—or may contain region-specific news. In rare instances, the advertising may not change from one zone to another, but there will be different region-specific editorial content. For example, both the New York Times and Wall Street Journal offer a regional edition, printed through a local contractor, and featuring locale-specific content. The Journal's global advertising rate card provides a good example of editioning. There has also been an emerging class of "international newspapers." Some, such as the Stageman International Weekly, the Christian Science Monitor, and the International Herald Tribune, have always had that focus, while others are repackaged national newspapers or “international editions” of national-scale or large metropolitan newspapers. Often these international editions are scaled down to remove articles that might not interest the wider range of readers. Newspapers have also been developed around very narrow topic areas, such as news for merchants in a specific industry, fans of particular sports, fans of the arts or of specific artists, and participants in the same sorts of activities or lifestyles. Broadsheet: 600 mm by 380 mm (23½ by 15 inches), generally associated with more intellectual newspapers, although a trend towards “compact” newspapers is changing this. Tabloid: half the size of broadsheets at 380 mm by 300 mm (15 by 11¾ inches), and often perceived as sensationalist in contrast to broadsheets. Berliner or Midi: 470 mm by 315 mm (18½ by 12¼ inches) used by European papers such as Le Monde in France, La Stampa in Italy, and, since September 12, 2005, the Guardian in the United Kingdom. Newspapers are usually printed on inexpensive, off-white paper known as newsprint. Since the 1980s, the newspaper industry has largely moved away from lower-quality letterpress printing to higher-quality, four-color process, offset printing. In addition, desktop computers, word processing software, graphics software, digital cameras, and digital prepress and typesetting technologies have revolutionized the newspaper production process. These technologies have enabled newspapers to publish color photographs and graphics, as well as innovative layouts and better design. To help their titles stand out on newsstands, some newspapers are printed on colored newsprint. For example, the Financial Times is printed on a distinctive salmon pink paper, the Italian sports newspaper La Gazzetta dello Sport is printed on pink paper, while L'Équipe (formerly L'Auto) is printed on yellow paper. Both the latter promoted major cycling races and their newsprint colors were reflected in the colors of the jerseys used to denote the race leader; thus, the leader in the Giro d'Italia wears a pink jersey, while the Tour de France leader wears a yellow jersey, or maillot jaune. Many publishers are developing online newspapers to supplement their print editions. 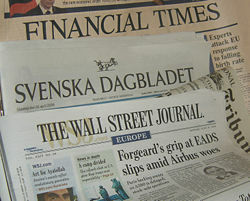 Online newspapers allow for more frequent updating (or publishing) of news, and provide an avenue for instantaneous conversation about the events as they occur. It is not unusual for newspaper reporters and even editors to maintain "blogs" (online journals or forums), or for newspapers to add forums to their websites for easy response from readers. Online newspapers must abide by the same legalities as do their sister publications. Professional journalists have some advantages, as editors are normally aware of the potential for legal problems. However, as independent citizen-journalists became more prevalent on the internet, the potential for lawsuits increases. These include suits over libel, questions regarding negligence or actual malice, or suits regarding invasion of privacy torts (such as appropriation, intrusion, private facts, and false light). News reporters in progressive newsrooms and journalism students in schools around the world are now taught about the "convergence" of all media and the need to have knowledge and skills involving print, broadcast, and web. A newspaper may include weather news and forecasts, an advice column, critic reviews of movies, plays, restaurants, and so forth, editorial opinions, a gossip column, comic strips, and other entertainment, such as crosswords, sudoku, and horoscopes, a sports column or section, a humor column or section, or a food column. In addition, newspapers carry significant amounts of commercial advertising, as well as classified and personal advertising. Editorials serve as the mouthpiece for the ownership or editorial boards of newspapers. They are normally unsigned to highlight that they are representative of the entire group of ownership and editors. Editorials are used for editors to comment on any situation in current events and are not presented as strictly news, but very much as opinions. It is from these editorials that the ideological leanings of the people running the paper are made most obvious. Another way by which editors and newspaper owners express their opinions is through the use of editorial or political cartoons. The number of copies distributed, either on an average day or on particular days (typically Sunday), is called the newspaper’s “circulation” and is one of the principal factors used to set advertising rates. Circulation is not necessarily the same as copies sold, since some copies or newspapers are distributed without cost. Readership figures are higher than circulation figures because many copies are read by more than one person. According to the Guinness Book of Records, the daily circulation of the Soviet newspaper Trud exceeded 21.5 million in 1990, while the Soviet weekly Argumenty i fakty boasted circulation of 33.5 million in 1991. Japan has three daily papers, the Asahi Shimbun, Mainichi Shimbun, and Yomiuri Shimbun, with circulations well above four million. Germany’s Bild, with a circulation of 4.5 million, was the only other paper in that category. In the United Kingdom, the Sun is the top seller, with around 3.2 million copies distributed daily (late 2004). In India, the Times of India is the largest English newspaper, with 2.14 million copies daily. According to the 2006 National Readership Study, the Dainik Jagran is the most-read, local-language (Hindi) newspaper, with 21.2 million readers. In the U.S., USA Today has a daily circulation of approximately two million, making it the most widely distributed paper in the country. A common measure of a newspaper’s health is market penetration. Market penetration is expressed as a percentage of households that receive a copy of the newspaper against the total number of households in the paper’s market area. In the 1920s, on a national basis in the U.S., daily newspapers achieved market penetration of 130 percent (meaning the average U.S. household received 1.3 newspapers). As other media, such as radio and television, began to compete with newspapers, and as printing became easier and less expensive, giving rise to a greater diversity of publications, market penetration began to decline. It wasn't until the early 1970s, however, that market penetration dipped below 100 percent. By 2000, market penetration was 53 percent. Most newspapers make nearly all their money from advertising; the income from the customer’s payment at the newsstand is small in comparison. For that reason, newspapers are inexpensive to buy, and some are free. The portion of the newspaper that is not advertising is called "editorial content," "editorial matter," or simply "editorial," although the last term is also used to refer specifically to those articles in which the newspaper and its guest writers express their opinions. A more recent development is the "advertorial." "Advertorials" are most commonly recognized as an opinion-editorial that third-parties pay to have included in the paper. They commonly advertise new products or techniques, and the tone is usually closer to that of a press release than of an objective news story. Publishers of commercial newspapers strive for higher circulation, so that advertising in their newspaper becomes more effective, allowing the newspaper to attract more advertisers and to charge more for the service. But some advertising sales also relate to market demographics: some newspapers might sacrifice higher circulation numbers in favor of an audience with a higher income. Classified advertising is a form of paid advertising which is particularly common in newspapers and other periodicals. A "free ads paper" is a newspaper containing only classified ads, usually grouped into an extensive set of categories. Classified advertising is so called because it is generally grouped within the publication under headings classifying the product or service being offered (headings such as Accounting, Automobiles, Clothing, Farm Produce, For Sale, For Rent, and so forth) and is grouped entirely in a distinct section of the periodical, which makes it distinct from display advertising, which often contains graphics or other artwork and that is more typically distributed throughout a publication, adjacent to editorial content. Business opportunities often use classifieds to sell their services. Classified ads are also among the tools used by many companies in recruitment for available job opportunities. Classified advertising is usually textually based and charges are calculated according to the number of words or lines of text. Thus, it can consist of as little as the type of item being sold (such as "Clothing") and a telephone number to call for more information. It can also have much more detail, such as name to contact, address to contact or visit, a detailed description of the product or products. A "personal ad" or "personal" is an item or notice traditionally in the newspaper, similar to a classified ad but personal in nature. Personals are generally meant to find romance or friendship, and usually include a basic description of the person posting it, and their interests. Due to newspaper prices being based on characters or lines of text, a jargon of abbreviations and acronyms has developed for use in personals. Since newspapers began as a journal (record of current events), the profession involved in the making of newspapers began to be called "journalism." Much emphasis has been placed upon the accuracy and fairness of the journalist. Criticism of journalism is varied and sometimes vehement. Credibility is questioned because of anonymous sources; errors in facts, spelling, and grammar; real or perceived bias; and scandals involving plagiarism and fabrication. In the yellow journalism era of the nineteenth century, many newspapers in the United States relied on sensational stories that were meant to anger or excite the public, rather than to inform. The more restrained style of reporting that relies on fact checking and accuracy regained popularity around World War II. In the past, newspapers have often been owned by so-called press barons, and were used either as a rich man’s toy, or a political tool. By the beginning of the twenty-first century in the United States, a greater number of newspapers (and all of the largest ones) were run by large media corporations. This move led to concerns that the growing need for profit growth natural to corporations would have a negative impact on the overall quality of journalism. 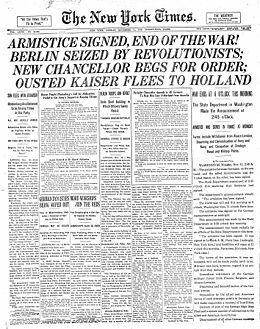 Newspapers, however, have played an important role in the exercise of freedom of expression in the modern world. "Whistle-blowers" and those who “leak” stories of corruption in political circles often choose to inform newspapers before other mediums of communication, relying on the perceived willingness of newspaper editors to expose the secrets and lies of those who would rather cover them. However, there have been many instances of the political autonomy of newspapers being curtailed. Even though the opinions of the owners are often relegated to the "editorial" section, and the opinions of other writers and readers are in the "op-ed" (opposite the editorial page) and "letters to the editor" sections of the paper, newspapers have been used for political purposes by insinuating some kind of bias outside of the editorial section and into straight news. For example, the New York Times is often criticized for a perceived left-wing political slant to its stories, or, by others, for supporting the American political establishment, whereas the opinion pages (but not the news pages) of the the Wall Street Journal generally take right-wing positions. Some ways newspapers have tried to improve their credibility are by appointing ombudsmen, developing ethics policies and training, using more stringent correction policies, communicating their processes and rationale with readers, and asking sources to review articles after publication. Many larger newspapers are now using more aggressive random fact checking to further improve the chances that false information will be found before it is printed. The future of newspapers is uncertain, with overall readership slowly declining in most developed countries due to increasing competition from television and the Internet. From its highest market penetration of 130 percent in the 1920s, newspaper penetration in the United States fell to just over 50 percent by the end of the twentieth century. However, at that time, newspaper influence and profitability were still strong. The 57th annual World Newspaper Congress, held in Istanbul in June 2004, reported circulation increases in only 35 of 208 countries studied. Most of the increases came in developing countries, notably China. A report at the gathering indicated that China tops total newspaper circulation, with more than 85 million copies of papers sold every day, followed by India with 72 million—China and India are the two most populous countries in the world—followed by Japan with 70 million and the United States with 55 million. The report said circulation declined by an average of 2.2 percent across 13 of the 15 countries that made up the European Union before May 1, 2004. The biggest declines were in Ireland, down 7.8 percent; Britain, down 4.7 percent; and Portugal, where numbers fell by 4.0 percent. One growth area is the distribution of free daily newspapers, which are not reflected in the above circulation data, and which grew 16 percent in 2003. 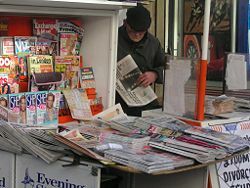 Another growth area is high-quality tabloids, particularly in the UK, where several of the major broadsheets are experimenting with the format. Smaller and easier to hold than broadsheets, but presenting serious journalism rather than traditional tabloid content, they appear to have drawn some younger readers who are otherwise abandoning newspapers. Newspapers also face increased competition from internet sites for classified ads, especially for jobs, real estate, and cars, the advertising of which has long been a key source of newspaper revenue. However, many believe that the internet can itself be used to newspapers’ advantage. For instance, it allows newspapers to effectively compete with broadcast journalism in presenting breaking news online in a timelier manner than printing allows. Some newspapers have attempted to integrate the internet into every aspect of their operations, for example with reporters writing stories for both print and online, and classified advertisements appearing in both media; others operate websites that are more distinct from the printed newspaper. Many in both camps believe that newspapers will increasingly leave breaking news to online and broadcast media, with print publications focused on comment and analysis. Though physical newspapers themselves are becoming less profitable, there is still a great demand to own one. This demand stems from a number of factors. Owning a newspaper (or chain of newspapers) is highly prestigious and seen as a sign of legitimacy for major broadcasting or publishing empires such as that of Rupert Murdoch. Newspapers are also seen as a public good and play a role in maintaining an informed base of citizens, which is vital in a democracy. Newspapers also offer corporations or wealthy individuals a voice on public matters and allow them a chance to be heard by many people on whatever matter they deem important through the use of editorials. Democracy was more manageable when the mass media and their associated advertising for mass-produced goods tended to mold us into one culture. But that started to change after World War II. For some time now, historians have seen the world in three stages: a pre-industrial period when social life was local and small in scale; the industrial period, which made both mass communication and mass production possible; and the third or post-industrial stage, which shifted economic activity from manufacturing to services.… The mass media were already starting to break up the audience into smaller and smaller segments.… If we're all attending to different messages, our capacity to understand one another is diminished. For newspapers to survive and flourish as new technologies continue to advance methods of communication, they must adjust their product to match consumer demand. Newspapers as brands still hold tremendous sway with the public. The credibility and strong brand recognition of well-established newspapers, and the close relationships they have with advertisers (particularly in the case of local newspapers), are also seen by many in the newspaper industry as strengthening their chances of survival. The movement away from the printing process can also help decrease costs. While they may no longer be the purveyors of information regarding current events, the opinions they present on such matters, and on new products and services being developed, continue to have great influence over the public. As such, newspapers may indeed continue to hold an important place in society. ↑ A Brief History of Newspapers. The Newspaper Industry. Retrieved January 9, 2007. ↑ WSJ Advertising: Global Edition. Wall Street Journal. Revised January 2, 2007. Retrieved January 3, 2007. ↑ Dailies add 12.6 million readers: NRS. The Hindu, August 29, 2006. Retrieved January 3, 2007. ↑ Top 100 Daily Newspapers in the U.S. by Circulation. BurrellsLuce. Retrieved April 13, 2007. ↑ Newspapers: Audience. The State of the News Media 2004. Journalism.org. Retrieved January 3, 2007. ↑ Philip Meyer, The Vanishing Newspaper: Saving Journalism in the Information Age (University of Missouri Press, 2004 ISBN 0826215688). AllYouCanRead.com — 23,000 Newspapers and Magazines from 200 Countries. Daily showcase of newspaper front pages from around the world. Exhibition on the Occasion of the 400th Anniversary of the Newspaper in the Gutenberg-Museum Mainz (Germany). NewspaperIndex.com — The most significant newspapers in every country in the world. SmallTownPapers - Current editions of 250 newspapers from small U.S. towns. This page was last modified on 21 November 2018, at 17:08.